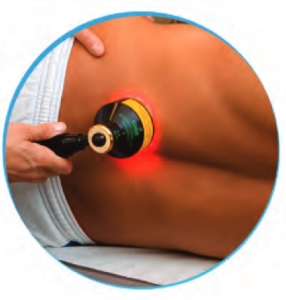 Cold lasers emit visible coherent light that is focused on injured areas. Studies show that cold laser therapy increases energy production at the cellular level. This energy increases microcirculation which reduces inflammation and enhances tissue healing within the injured areas. Healing is a cellular process and light energy initiates a cascade of reactions, from the cell membrane to the cytoplasm, to the nucleus and DNA. 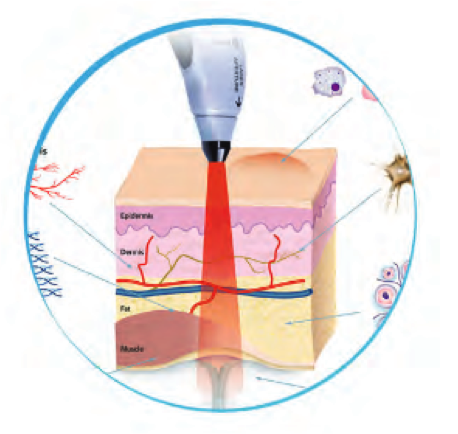 There are many biological processes that take place in tissues that have been shown to respond to the cold laser therapy. The overall effects of the treatment site are decreased pain and decreased inflammation, as well as increased range of motion. Because the cold laser emits a low level of power output and its beam penetration is deep, it has been proven to significantly accelerate and enhance the body’s natural defense and ability to repair itself when injured. Initially, swollen tissue prevents movement of damage tissue. Common Questions About Cold Laser Therapy? Does it hurt? How does it feel? The typical treatment duration is 5-15 minutes depending on the size of the area being treated and the severity. During the 20 years of being used by healthcare providers all over the world, very few side effects have been reported. If a patient is allergic to light then they may get a rash or blister for a few days. Occasionally some old injuries or pain syndromes may feel aggravated for a few days, as the healing response is more active after treatment. Fill out the form below and let’s begin the conversation about using cold laser therapy to relieve your pain.